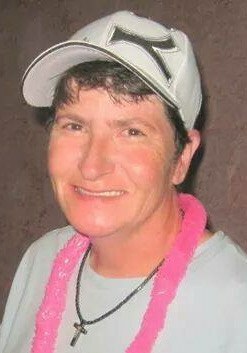 Deborah Jo “Debbie” Goodnough, 56, of Clyde Township, died Wednesday, December 5, 2018, surrounded by her loving family. She was born July 18, 1962 in Escanaba. She married Angela Sarazin on August 20, 2016 in Port Huron. Debbie worked at Subway. She was a woman of many talents and always had a smile on her face. She was the ultimate Yankee fan and always wore her Yankee gear. She was happiest hanging out with family and friends and cutting lawns. She was always on the go, either helping someone or doing lawn care. She loved her kids and grand babies more than she could ever express. She is survived by her wife, Angela; two sons, Jeffrey (Stephanie) Schreiber and Christopher (Jana) Schreiber; a daughter, Taylor (Scott) Schrandt; grandchildren, Christopher, Kyle, Frankie and Raelyn; and a very special niece, Audrey Beery. She was preceded in death by her mother, Sheila Schott, and her father, Kenneth Goodnough. Funeral services will be held at 3 p.m. on Friday, December 7, 2018 in Pollock-Randall Funeral Home with visitation beginning at 1 p.m. The Rev. Eric Miller will officiate.